Summer News Update | Birkebeiner Nordic Ski Club Inc.
With great sadness we note the passing of Doug Westerman who passed away on the 17th January 2019 after a short illness. Doug was one of the clubs’s foundation members (1977) and was involved with the Hoppet as the High Plains Co-ordinator, since its beginning in 1991. He assisted in the early days of the Birkebeiner race, was very active in the club’s search & rescue squad as a field officer and as a hard working teacher at Mt Beauty Secondary College leading its ski team to many wins. Since 2012, Birkebeiner has invited an international skier to volunteer with our club to assist with many events and training sessions for members. A few renovations and upgrades are going on. We plan on installing two new 100V external horn speakers at the front of the race hut, replacing the roving microphone with a new duel wireless microphone set-up, and installing a new music source with Bluetooth and phone integration. So for race and event organisers we will hopefully have a seamless system ready to go this winter. The middle room of the race hut will be reorganised with new shelving so that all the V-boards, poles, flags, etc. are located in the one place, facilitating race day setup and pack up. This work will take place shortly. We will also see non-slip matting and even some new hut lining. Further down the track (2020) we may even see an extension to the race hut that will provide a better space for event management and for looking after volunteers. Thanks to Brian Keeble, Peter Smith and Paul L’Huillier for moving these projects along. The 2019 Australian Race Calendar has been released by SSAXC. It is possible that minor details such as starting times and contacts may change, however event dates and locations should all be final. Australian Junior Championships — For 2019 and 2020 the Australian Junior Championship will be held on the fifth weekend of August (the weekend after the Kangaroo Hoppet). The calendar can be viewed in PDF format. Click the green button. Nic Blackwell, Kat Paul & Darcie Morton were the only Birkie members selected in the Junior Team that competed in the championships in Lahti Finland. Kat Paul skied in the U23 World Champs and just missed getting into the top 30 for finals with a 33rd place. Team coach Callum Watson has reported on the team. Click the blue button to view the report. 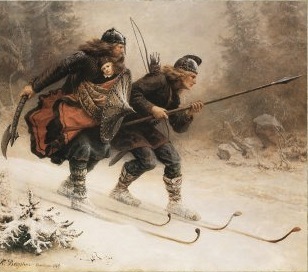 History of Skiing in Australia & the Birkebeiner race. Click the purple button below. Order of Australia Recipients. Click the yellow button below. This entry was posted in Information, Race Info & Results. Bookmark the permalink.